As experts in travel, let us plan your unforgettable escape. Celebrate your Costa Rica honeymoon with a package suited for romance in a land of passion and exotic landscapes. Discover waterfalls, tropical forests, and one of Costa Rica's most exotic regions. Who knew romance and adventure could be so good together? Spark the romance at two of the top rated hotels in Costa Rica. Priceless views, hot springs, and tours included! Start rough in the rainforest with whitewater rafting. Then move to smooth Manuel Antonio where you will relax in an exclusive beachfront resort. Treat yourself while having the romantic vacation of a lifetime! Indulge at famous hot springs and spa then to Guanacaste to enjoy some water sports! Get the ultimate honeymoon experience and explore Costa Rica far and wide. Discover volcanoes, adventure, beaches and luxury in a package that showcases the best of Costa Rica. Surrender yourself to the most romantic evenings at the finest boutique hotels in tropical Costa Rica. Love is truly in the air in this vacation package. Stay at a rustic inn surrounded by lush gardens under Arenal Volcano, then on to sunny Manuel Antonio for one of the most unique hotels in the country! This package has all you need to get you closer to your significant other while also getting to know four iconic parts of Costa Rica. Enjoy some of the most intimate and luxurious resorts in Costa Rica. Celebrate romance in the vicinities of 2 stunning volcanos and Guanacaste beaches. Escape from the fuss of the world and enjoy the best of Costa Rica in this romantic getaway. Volcanoes and sandy beaches, thrills and relaxation are just the start. From exclusive boutique hotels to luxury world-class resorts, Costa Rica honeymoon packages offer unique destinations and wonderful experiences. Spend precious time with your partner as you travel to lush hot springs and lounge at sandy beaches. Stay in the most romantic resorts and go on thrilling tours to spice up the experience. The allure of this tropical paradise is difficult to resist. If you’re ready to start the rest of your life with a beloved one, do it in style. Whether you want to take it easy, pump it up, or a little bit of both, consider one of our Costa Rica packages. They are completely customizable! Costa Rica is renowned for its natural beauty. For newlyweds, this means it is a perfect destination to enjoy the beginning of your journey together. Unique Costa Rica honeymoons are one of the best ways to get away from it all and focus on what really matters: you and your partner. With advice from local experts, deciding where to go and what to do is easy. Whether it is an all-inclusive honeymoon or a more boutique experience, there are options to choose from. If you prefer the bustling spirit of a resort and amenities, the coast is the perfect destination. To experience something more intimate and quiet, there are exclusive locations hiding in nature. Beaches, luxury, mountains, wildlife, relaxation, and adventure are all waiting. Enjoy tranquility and exciting activities in a vacation package personalized to fit both of your personalities. Simply tell your travel consultant what you want, and it will happen! After months of planning and working hard for the perfect wedding, you deserve a break. Having a Costa Rica honeymoon is the best way to do unwind and forget about the outside world. Nothing beats the coastlines of the country for rest and relaxation. It’s not just the soothing sounds of the sea, but the lively green of the forests around it. To experience it firsthand, lose yourself in the stunning scenery of Costa Rica’s Pacific Coast. With some of the best beaches in Central America, Guanacaste and the Central Pacific are perfect for lovebirds in search of comfort and luxury. And with a wide array of hotels to choose from, Costa Rica honeymoons make the best of nature as well. Take tours through hidden beaches, go on whale-watching tours, or lounge in infinity pools that open to some of the best views in the country. Explore this world on foot, horseback, or even bicycles. There is much to see and share together. Tropical rainforests offer an amazing experience for a Costa Rica vacation. Flora and fauna are abundant, and beauty appears on every nook. Spend an afternoon hiking through the depths of Manuel Antonio National Park to discover its vibrant jungle. Or combine this experience with a stay at Arenal’s hot springs for extra relaxation and lovely views. Alternatively, to indulge in some “us time,” opt for a little pampering at the hotel’s spa. Many Costa Rican honeymoon resorts boast full-featured luxury spas with facilities like Jacuzzis, massage therapy, and mud baths. Finish it off with a romantic dinner. As the sun sets over the Pacific Ocean, the two of you can enjoy a lovely view of the water at an intimate restaurant. There’s no better way to create a lifelong memory. As experts in luxury travel, we can make your Costa Rica honeymoon package as opulent as you want. Tell us your standards and desires, and we’ll gladly help. Searching for more excitement? That’s perfect! Of course, lounging at the beach isn’t for everyone. If you and your sweetheart want to get the adrenaline pumping, Costa Rica honeymoons also provide the excitement of adventure. Costa Rica’s nature is one of the best experiences the country has to offer, and it has a variety of activities ideal for couples. 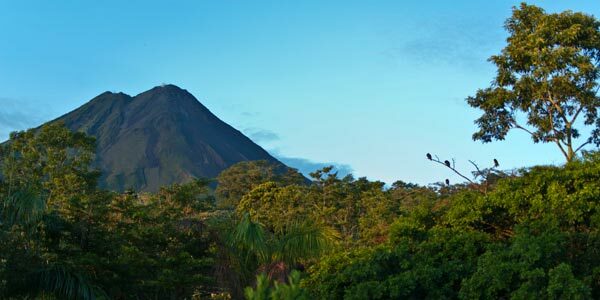 Take a hike through the jungle in the shadow of Arenal volcano, one the country’s most active and famous landmarks. Or go snorkeling on a private tour to explore the precious coral reefs for an afternoon. Or take a tram ride to see the forests from a different perspective. It’s all up to you! To take a walk on the wilder side, embark on a thrilling whitewater rafting adventure down the Toro river in Arenal. Alternatively, enjoy Costa Rica’s splendor as birds do and take a canopy tour high above the trees of Manuel Antonio National Park. Feel the rush of moving as one with the rafts, or the joy of sliding down a zip line with the magnificent canyons below. And if you’d rather stay on the ground, a canyoning expedition is the perfect fit. Explore Manuel Antonio on foot, hiking past stunning waterfalls and making your way through the ups and downs of the jungle. For newlywed adventurers, a honeymoon in Costa Rica is truly an unforgettable experience. For adventurers, even more so! If you want to get more information, or just strike up a conversation about your options, contact us. We’re glad to help! For any love birds out there looking for a perfect Costa Rica wedding, our wedding travel planners are here to help you create beautiful memories for the rest of your life. If your dream is to share the most important moment of your life with your loved one in a tropical paradise, then Costa Rica is a perfect match! Stay at a boutique hotel with personalized service, where you can be pampered and treated just right! You can book a private dinner, have a couples massage or go on a private tour to experience Costa Rica nature and wildlife.